She adores everything about them, even their farts and poops. It's her life long ambition to become a famous animal scientist so she documents everything in her diary. Olga confides everything through her illustrated pages. It's here that she reveals she feels much more comfortable with animals than she does with people. One day, Olga discovers a strange creature in her rubbish bin, a creature with slightly dumb eyes and a pudgy shape. This unusual animal drops rainbow coloured poop. Is it an alien? A new species? There's only one way to find out and that's to investigate. Olga's questions lead her to other people, people who aren't quite as annoying as she thought. But then Olgamus Ridiculus disappears. 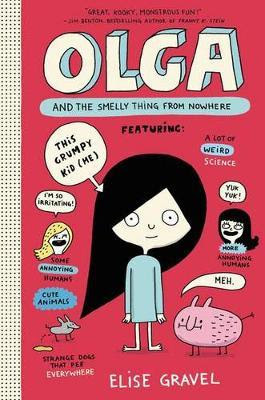 Olga's over-active imagination took me down unexpected dead ends and sometimes left me snorting with laughter, despite myself. But the thing that made me enjoy Olga's story the most was her sweet vulnerable heart. There is a happy ending, but it might not be the one you expect.